Why you should buy me: Swivel chair with a premium seat and mesh backrest (58 cm). Delta-Synchron-plus mechanism with seat-tilt and seat-depth adjustment. Height and width adjustable arms with PU armrests. 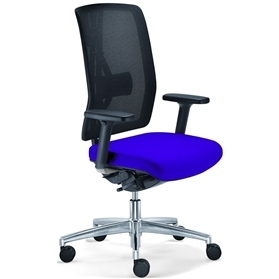 Adjustable lumbar support Polished aluminium base Manufacturer - Dauphin (Germany) Free UK Mainland Delivery - 4 weeks Guarantee - 5 Years Assembled - Yes If you would like this chair in a different Dauphin approved fabric please contact us.